... quiet, but with a bold personality. not sure if i'm attracted to the checkered door more, or the nautical window. 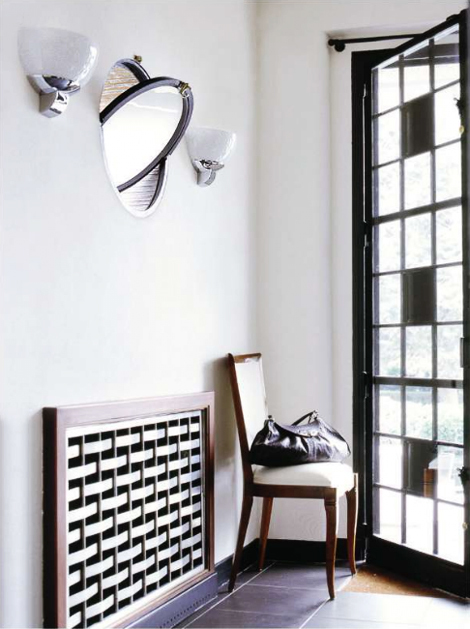 and how about that woven radiator cover? brilliant. love the gorgeous simplicity of this room!! and can't wait to hear about your exciting news! What an incredibly unique space. The woven radiator cover is brilliant. And, well, I'm just a sucker for a flippy nautical window. Open seas, arrrrgh! jen - flippy nautical windows, yes!!! today i tweeted "so excited to what's to come in 2011. can't wait to share!!!" are you on twitter? the door! i can see what heidi means, but i immediately thought that the door has this old industrial space feel - makes me want to live in a prewar factory!